Welcome to Cheap Eats NYC, where every week, we'll be highlighting an incredible NYC meal for less than $10. Know of a great all-you-can eat Indian buffet, under-the-radar burger, or other cheap eat in the five boroughs? Let us know in the comments! Nestled on Mott St in that not-quite-Little Italy, not-quite-Chinatown area is a nondescript storefront with a bright-red awning. Pho Bang goes almost unnoticed on the street, getting lost in the sea of restaurants and markets that surround it, but it deserves attention solely because it serves hard-to-come-by Bun Cha Ha Noi. The dish is a popular Vietnamese street food from the northern city of Hanoi. (If it sounds familiar, it’s probably because Anthony Bourdain and President Obama ate it during the recent Hanoi episode of the CNN series Parts Unknown.) It’s a DIY dish that consists of a heaping pile of bun (rice noodles); a plate of crisp lettuce and fresh mint; a bowl of grilled pork shoulder and cha (minced pork patties) in an aromatic broth of vinegar, sugar, and the Vietnamese trademark nuoc mam (fermented fish sauce); and, finally, an empty bowl for you to put it all together. The arrival of all the different plates may be daunting at first, but the waiter will kindly impart helpful instructions. 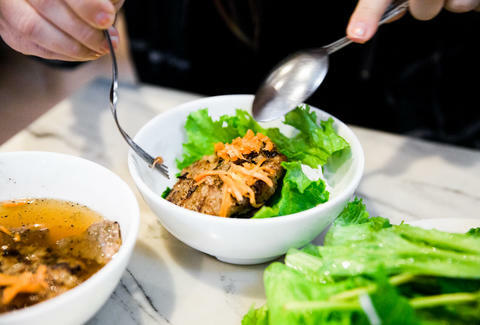 First, put the bun into the empty bowl, then add the lettuce (tear it), then the meat, then the nuoc mam, and finally, garnish the whole thing with mint. There’s also sweet hoisin sauce and decently spicy red chili paste to add to the mix. Slurping is both inevitable and acceptable here. The pork is juicy, the noodles are perfectly soft, and the fish sauce pulls the whole thing together by being blissfully light, decidedly not fishy, and well-balanced between salty and sweet. Gabrielle Van Tassel is an editorial intern at Thrillist and frequently finds herself in cash-only eateries without any cash. Follow her on Instagram.